Panic and rage gripped Turkey on Friday night as NATO’s second largest army embarked on a coup against President Recep Tayyip Erdogan. While government supporters rushed to the streets following a call by Erdogan and his prime minister to “save democracy,” many others rushed to neighborhood shops to stock up on basic supplies, emptying them of bread, water and other necessities. Just hours after bars and restaurants had abruptly emptied of the usual Friday partygoers, the mosques in Istanbul sounded a long and untimely call for prayer at 1:30 am, which locals said was identical to the call that announces death, and which many speculated was a rallying cry for the government’s religious supporters. 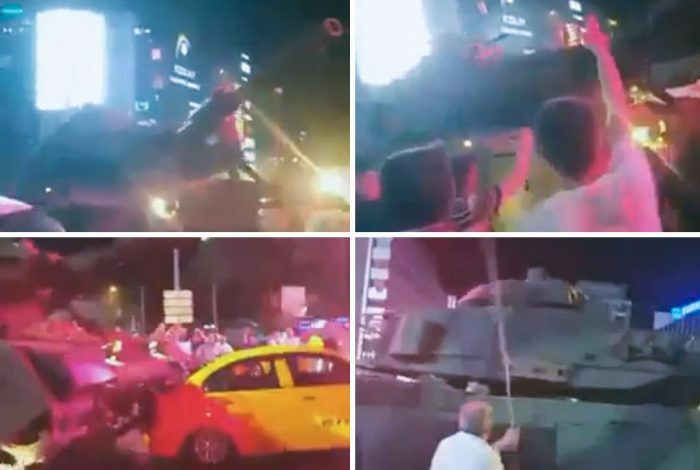 In Ankara, pro-government F-16s reportedly shot down a helicopter carrying coup supporters, while a helicopter was shown on television firing at government supporters on the ground. “There are so many explosions it’s impossible to sleep,” Rasul from Ankara said in a phone interview. He lives close to the government quarters, and asked that his last name not be used. In Istanbul, gunfire, explosions and the screeching sound of low-flying military jets rang over the city. Turkish TV showed large groups of government supporters in the city center and in other Turkish cities, but near the first bridge on the Bosphorus, where some of the action between rival security forces was taking place, only a few youths with beers loitered late in the night. “Turkey is going to hell,” one proclaimed. A prominent Turkish democracy activist interviewed by WhoWhatWhy said he feared things would end badly, with — regardless of who wins — widespread arrests and potentially bloody purges of real or perceived enemies. He echoed concerns shared by many others on social media, and born of the country’s painful experience with a string of military coups over the past few decades. Late into the night, it was not clear who had the upper hand, with Turkey’s leaders sending defiant messages in calls to the media. But with reports of military and police shooting at each other, military jets and helicopters flying low over Istanbul and Ankara, gendarmes taking over bridges, airports and intersections, a key Western ally in the fight against ISIS is descending into chaos. WhoWhatWhy has reported extensively on the growing rifts and divisions in Turkey and Erdogan’s power grab in recent years. You can read our article discussing the possibility of a coup from a couple of months back here.